D'you see? Television cameras on da roof. We watch everywhere. We plunge into a tunnel and out from the darkness careens the title of the film: The Trollenberg Terror, large and unequivocal, like the creature at its core. 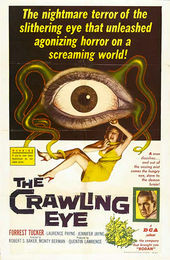 The film was adapted from the British TV series of the same name, but it would run through a gamut of names including Creature from Another World, The Creeping Eye, The Flying Eye, and finally, for its American release, The Crawling Eye, which was used on much of the promotional material. The design of the opening credits is steeped in a minimalist tradition now associated with title design of the era but only defined three years prior by Saul Bass, in his all-graphic sequence for 1955's The Man with the Golden Arm. Those thick white lines on black, directing the attention of the viewer while causing graphic tension, also make an appearance in the opening of 1956's It Conquered the World. All three would soon be overshadowed by another Bass opening which took the motif to its outer limit: Psycho (1960). 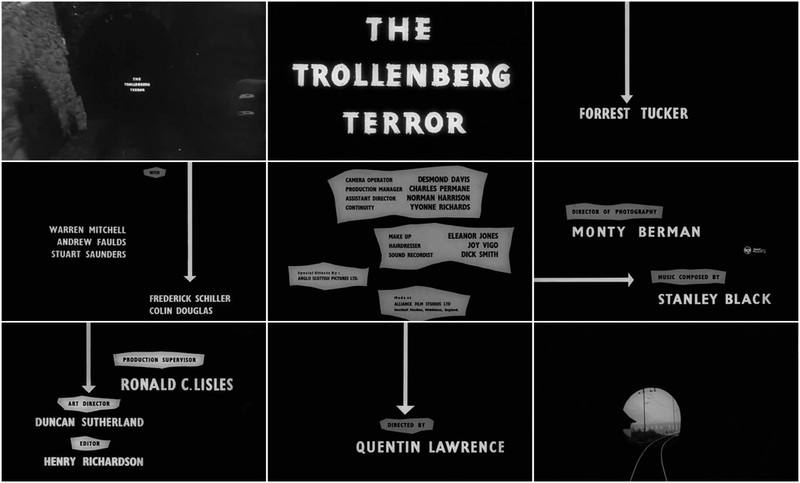 In 1989, The Trollenberg Terror – under the title The Crawling Eye – was mocked on the TV series Mystery Science Theater 3000. During the opening, Crow T. Robot asks, "How are you supposed to read these titles?"